I live in a small town in Alberta, Canada where cycling and style are not high on the priorities, but I'm working to change that. I've recently started a cycle club and always try to dress stylishly on my commute and errand runs. 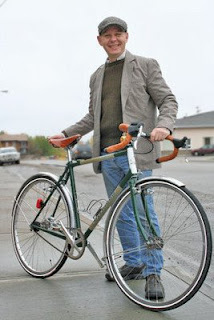 Here's a photo that recently ran in my local paper (of myself with my bike). Keep up the great blog. Very tony, Tony! Sorry, couldn't resist! Where in Alberta? My mom grew up in High River and we have family all around there--they are more likely to be seen riding horses than bikes! The town is Whitecourt. Sorry, not that close to High River but most people ride horses and SUV's here. I'm working on making the bikes more popular.